When you buy in bulk, you typically get a better deal. On a per-unit basis, it’s cheaper to buy a 32-pack of Coca Cola at Costco than a single can in a convenience store. The same concept applies in industrial manufacturing, software licensing, and other industries. Sometimes, however, the buying more will cost you more, even on a per-unit basis. This makes economic sense if what you are buying is in short supply, and rather than letting the price float with the market, the seller wants to allocate the supply to a number of buyers, perhaps due to contractual obligations. If you want more than your allotment, you pay the market price, not the contract price. In some situations, it just seems like a tax on the mathematically disinclined. Take this example from an airport massage lounge. Sorry about the blurry image. 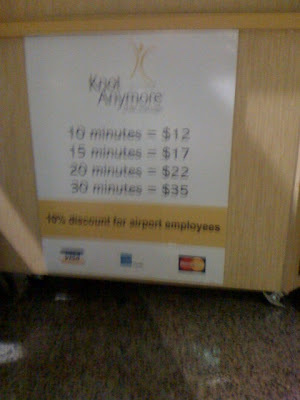 Here’s what the sign says, plus an additional column that indicates the $/minute of massage. I can get a 10 minute massage and a 20 minute massage for $34, $1 less than just getting a 30 minute massage. It probably says something about the way my brain is wired that this jumped out at me as I walked by. I asked the therapist on duty why this was the case. She said it had to do with the way they got reimbursed. When pricing is compromised by internal alignment issues, it’s usually easier to fix the alignment issues (as hard as that may be) than change the market. Let’s suppose they can’t fix the alignment issues and they have to price this way. What should they do? I’m not an expert when it comes to massage, but I’m guessing that you could offer a “30 Minute Deep Tissue Massage” or some other value-added offering that you simply can’t provide in less time. Maybe you add a foot massage. Then you raise the price to $40. And break it out separately from the per-minute massages on the board. Maybe the pricing structure is a function of the location. Encourage as many 10min massages in a high footfall location, keep queues to a minimum and massage as many passengers as possible. I agree with Jon, but I would have the cost of the 10-minute much higher, with a small “add-on” for 5 and 10 minutes, and then again higher, to incentive rotation. Jon, I like the theory, although it sounds like the pricing structure is internally driven from talking to the therapist on duty. Also, my statistically invalid observations suggest that there is rarely a wait.